The corner of 32nd & Race is pretty much on the border of Drexel's campus, but in the coming decades that stands to change. East of 32nd Street are the Septa railyards, the development of which are part of Drexel's Master Plan. That plan will take quite some time to execute, and it's entirely possible that the rail yards will look as they do today in thirty years. But we can say with some great confidence that the surface lot on the northwest corner of 32nd & Race will be changing much more quickly. And for the better. The other day, we were turned onto a Property story detailing plans for a new tower and new townhomes at this currently underused corner. The lot is owned by Drexel, but they're partnering with Radnor Property Group to build the project. These are the same developers currently building 3737 Chestnut, in case you don't recall (we didn't). 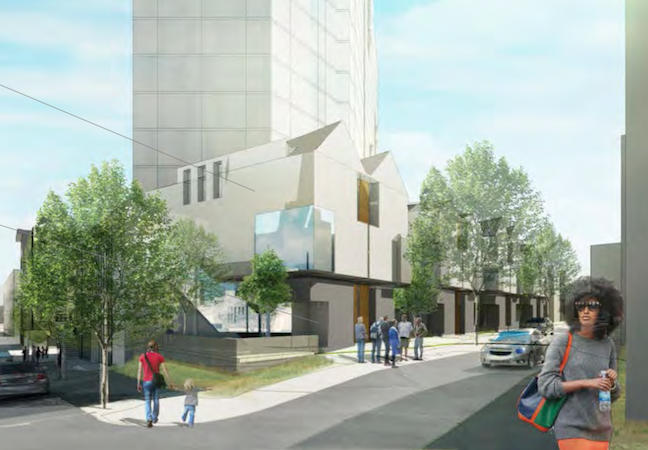 According to their Civic Design Review packet, plans call for 14 stories of residential with 122 one-bedroom units and 42 two-bedroom units. The first two floors will be a combination of lobby space, a fitness center, and a childcare facility with room for up to 164 kids. The basement will contain a small parking lot. In addition, there will be twelve low-rise residential units built and sold on Summer Street, replacing some worn-looking properties and vacant lots. Design work is being done by Erdy McHenry. If the day care component didn't give it away, this project isn't targeting undergrads, but is instead aimed at grad students and Drexel staff. 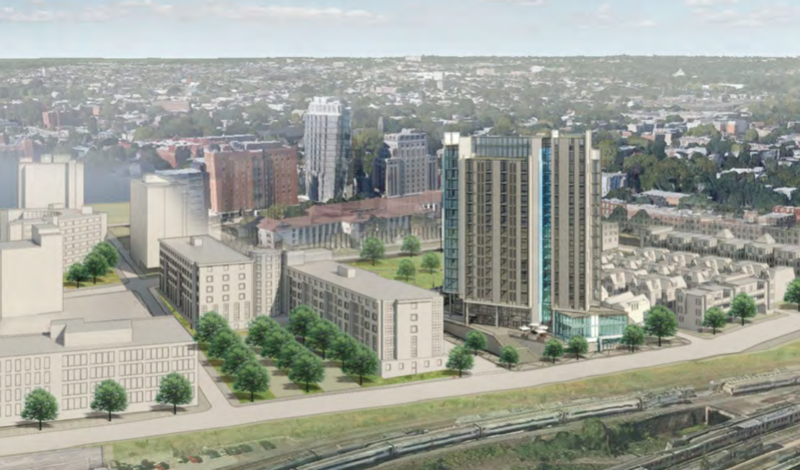 This represents a bit of a departure from most of the development we've seen in Powelton Village in recent years, and it strikes us that this might just be an underserved market. 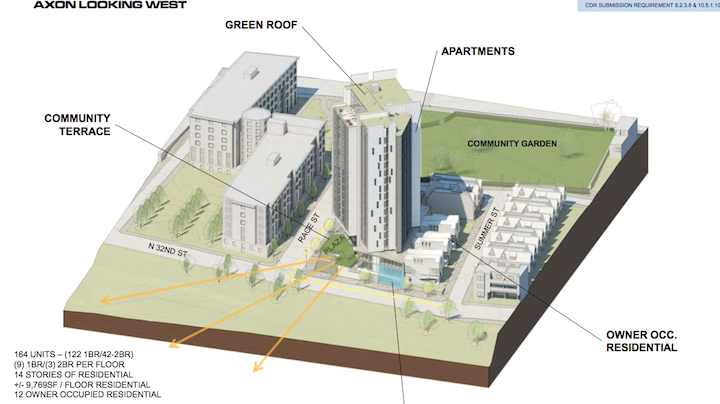 Another indication of the thoughtfulness of the project is the orientation of the building, designed to preserve sunlight for the community garden next door. And just imagine, if and when the railyards get redeveloped, this project will go from being on the fringe to being right in the middle of everything. Check back in a few decades to see how this one turns out.